"This shirt is well made. I enjoy wearing it. 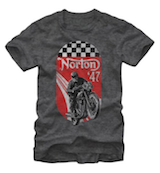 I once rode a Norton 750 for the summer and this shirt reminds me of that adventure." 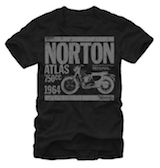 Officially Licensed Norton T-shirt. T-shirt has a vintage-style distressed print. Officially Licensed. 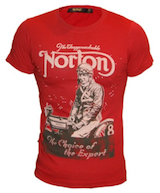 T-shirt has a vintage-style distressed print paying homage to Norton Motorcycles. 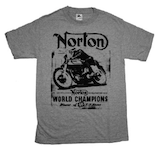 Check out this beautiful new fashion tee from Norton Motorcycle apparel. 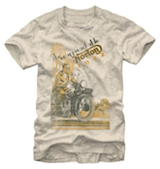 This great design is from a 1927 ad of the Model 18 Norton which was the first OHV Norton model with a 490 cc engine. At its introduction it got the factory code word of "Speedy" Alec Bennett won the senior TT on a model 18 with an average speed of 61.64 mph.